The Wife and I are always looking for new bodies of water into which we can throw our boats. So with extraordinary effort we got up early on a Sunday morning to drive the boats to a place I’d heard about all my life but never visited, Caroga Lake. The lake and the village alongside it is just inside Adirondack Park in Fulton County, a mere hour and ten minutes from Albany. The State boat launch was easy to find, eight bucks for a day pass, and because we dropped our boats into the water before 9:30 we got to enjoy the lake before the day got too hot and before it filled with annoying motor boats and jet skis. This is the main reason why we try to be early, the weekend summer vacationers tend to not get up early. After Noon the roaring of engines becomes constant and the waves kicked up by speedboats become impossible to avoid, that’s when we head back to where we launched and call it quits. But we also discovered that this lake, and the Village of Caroga Lake that sits along the shore, is in serious decline. The word impoverished comes to mind. While the old and relatively small vacation houses that line the shore are kept in good to excellent shape, the community itself that sits behind them is clearly struggling. And a little further inland along Highway 29A, almost all the businesses are shuttered except for a couple of roadhouse bars. Caroga is actually two lakes, called East Caroga and West Caroga. They are divided by a causeway, and the lakes have just one water connection between them, a narrow underpass that only allows small boats. The biggest boats we saw were pontoons, which are basically a deck sitting on a pair of flotation tanks that kick up a serious wave when their motors are full throttle, but none of them could have passed through this opening. 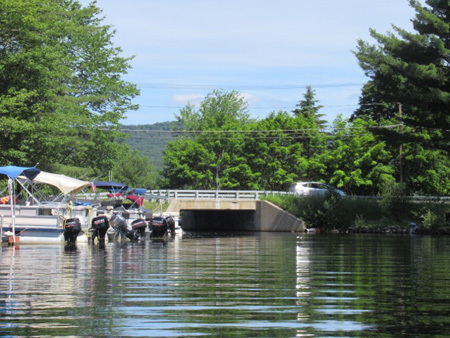 This of course was fine with us, the boat launch is in the East lake and the town in the West lake. Our plan was to circumnavigate the East lake and then zip over to the village on the other lake to land the boats on a convenient shore and, oh I dunno, find a place to have coffee, look around a bit, that sort of thing. It’s something we like to do, paddle around for a bit and find some dockside amenity where we can stretch our legs and get the blood circulating in our butts again after sitting in the boats. A lot of lakes we go to are overly built up along the shore, all too often choked with rich people’s McMansions that hardly ever get used. 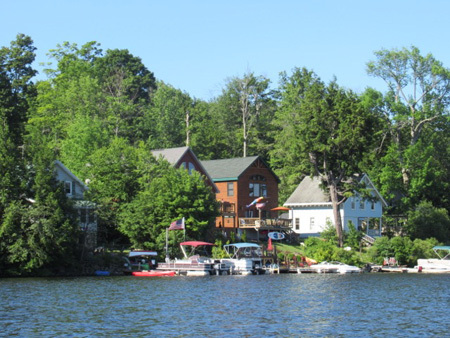 On these lakes we can often see smaller cabins that were built in the middle of the 20th century by middle class and working class people. All too often these cabins are bought up and torn down and the properties consolidated to accommodate the new unlovely empty McMansions. Surprisingly, we only saw a few McMansions here, and those were relatively small. Hundreds of older more comfortable human-scaled cabins dominated the shoreline. While looking at them, a childhood memory came back to me of listening to the adults talking about Caroga Lake, how crowded it was and why would anyone go up there. Of course, these adults that I was listening to were just jealous of not having lakeside cabins of their own, I realize that now. These cabins were nice to look at, most of them year round houses by the looks of them. 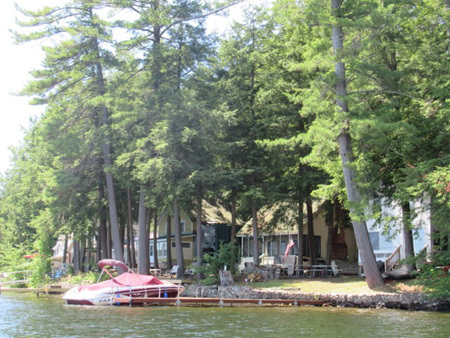 Unlike the cavernous McMansions most are not much bigger than the two bedroom cabin we stay in at Great Sacandaga Lake every year. 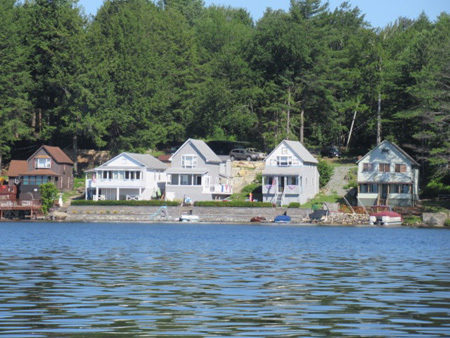 I noted that the cabins on Caroga were as close together as the houses in my Albany South End neighborhood. Caroga Lake is still a vacation spot of the middle and working classes. But in the first decade of this century, because of changes to laws governing the distribution of wealth in this country, the solvency of the middle and working classes has collapsed. Thus here in this place where us lower classes still dominated and the overly rich have not yet moved in and taken away the land, decay and signs of poverty are now starkly illustrated. This is Fulton County which has one of lowest median incomes in the State, even though it is right next to Saratoga County which has, if I recall correctly, the third highest median income behind Manhattan and Westchester. This stark disparity is the intentional result of the federal government’s financial restructuring of our society, which in this century has resulted in vast areas of mostly invisible poverty practically within a stone’s throw of rich ghettos like Saratoga. Yet unlike the rich ghettos these impoverished places somehow have to be searched for, just as we stumbled upon this one. The lake, as I said, was lovely that Sunday morning. 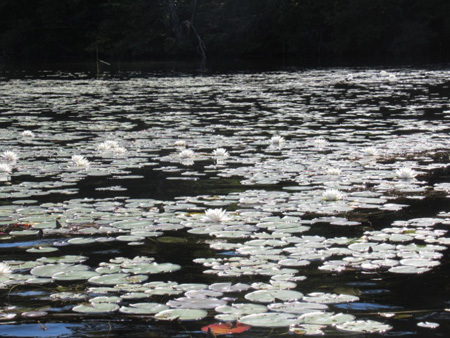 It is surprisingly shallow, only 13 feet at its deepest and thus impassable to large boats, these conditions allowed some sizable beds of white and yellow water lilies to thrive. 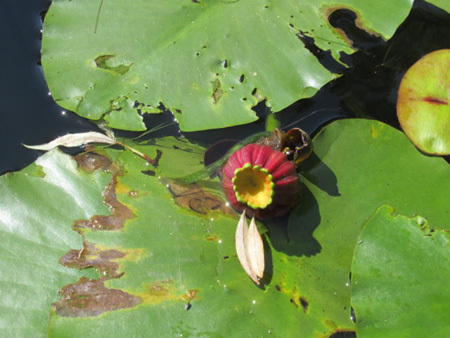 The flowers were in bloom all over the place among their islands of floating leaves. 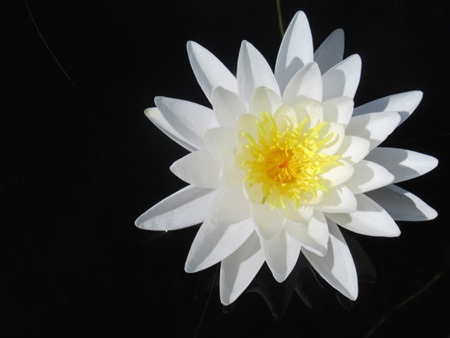 At one point I approached what looked to me from a distance like sun dazzled white puffballs floating on the water, up close they were a water field of white flowers. We passed through the water underpass. This causeway was built across what was once a single lake and today carries Route 10. But why was it built, why divide the lake like that? The histories available online are sketchy, but very likely this was to create water power for mills by raising the water level of one side of the lake. The inlet, Mead Creek, trickles down from the mountains into the West lake, while the outlet, Caroga (or Garoga) Creek flows from an arm of the East lake. In the 1800s sawmills predominated along with grist mills and several other kinds of mills. Logging and farming were the main sources of income for the area. By the 20th century the local trees had all been cut and the farms had mostly folded, that’s when tourism became the main economy. After we paddled through the causeway we headed along the village side of the West lake to the amusement park. The park was once well known, the major shoreline amenity and destination for day vacationers. But now it is abandoned, a sad hulk, a reminder of the now lost tourism prosperity that still barely sustains this region. Next to the shuttered main building of the amusement park was an excellent stretch of shore where we could easily land our boats. We quickly realized our landing spot had once been a carefully maintained sandy beach, an abandoned destination in itself. Posted signs informed us that we could not swim there because there was no lifeguard on duty. Since the level of the lake appeared to be pretty stable, the beach was reverting back to nature. The low lying ecosystem that had developed resembled Albany’s Pine Bush a few years after a clearing or a controlled burn. The sand was colonized with grass and clumps of wildflowers in bloom, along with what looked like garden flowers that had gone feral. All along this beach (and along a nearby private beach where we briefly landed) we saw these amazing big yellow butterflies with black edges sunning themselves and working the blooming flowers for nectar. 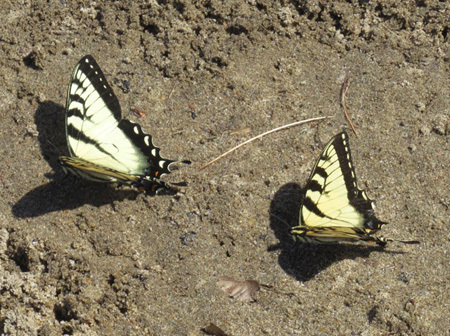 These turned out to be the Eastern Tiger Swallowtail, which can have a wingspan of more than six inches. This must have been the weekend that they emerged from their pupae, many were sunning themselves like new butterflies do. I watched one swallowtail harass a couple of other swallowtails and repeatedly get chased off, I wondered if this was macho posturing or was it sexual harassment. 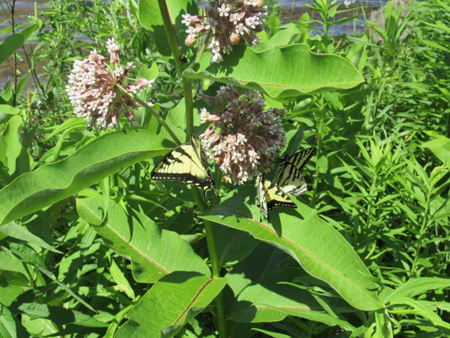 While out on the water we saw some of the swallowtails fluttering furiously across the West lake, a crazy senseless thing that butterflies often do. If they get tired and touch the water they’re done for. We speculated that they know enough to not get wet but are unable to tell the difference between a creek and a lake. 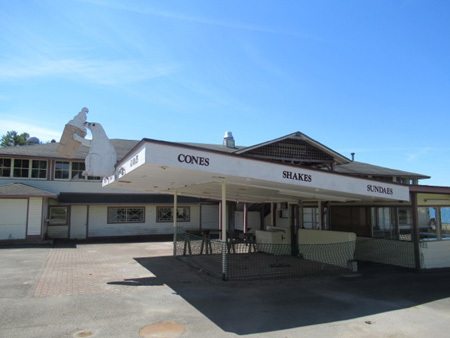 We walked around the abandoned amusement park buildings, which we discovered was called Sherman Park. The closed and boarded buildings were intact, not at all in an advanced state of decay, and the grounds kept orderly. 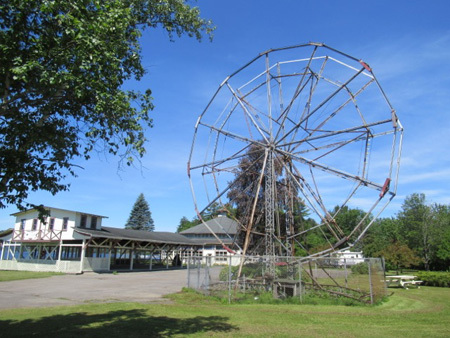 All the rides had been removed except for this one small vintage ferris wheel that was preserved behind a surrounding fence as a kind of monument. A complex of abandoned buildings is sad and fascinating to see. I found a flyer tacked inside a glass case on the side of one building announcing the music schedule for the 2005 season, so that probably means the place shut down for the season later that year and didn’t reopen for 2006. I noted that fireworks were scheduled for July 2nd, rain date July 3rd. And the late bluesman Ernie Williams was scheduled to perform on July 30. If the place had not gone under we could have had our dockside coffee and maybe a bite while we looked out at the water and watched the yellow and black butterflies. According to a posted price list for Sherman’s Pub we could have had a cheeseburger for $4, a tossed salad for $3.50 or chicken wings for $5. Peering in the window of the main building we could see an elaborate dining and drinking establishment, all in disarray but surprisingly showing no signs of either looting or water leakage. 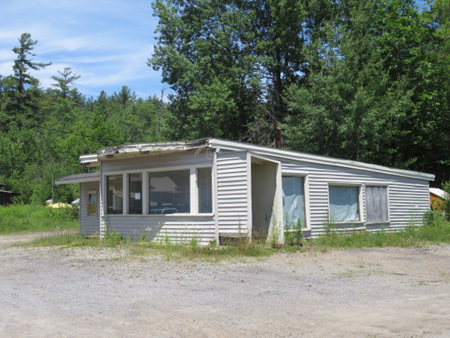 An interesting thing I noticed here and later at the other abandoned buildings out on Route 29A was that the grass around the buildings was being mowed this Sunday morning by what looked like older residents using their own lawn mowers. I didn’t talk to or deign to photograph any of them but I suspect that these folks were doing this on their own, not likely anyone was going to pay them. At the Sherman’s complex we even saw flower garden plots kept neat and in full bloom. 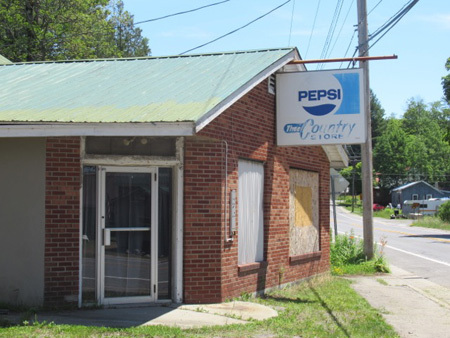 Caroga is a village full of old people, the median age for permanent residents is 59.6. And it is almost completely white, allegedly only 88.4% but we sure didn’t see any people of color. The village has the lowest median income in Fulton County and the lowest hourly wages. So many old folks populating this place makes me think that if the filth who are right now in control of the federal government successfully eliminate Social Security they will immediately plunge this community into much deeper poverty, the kind of poverty where people starve. Having seen enough we cast off from the beach and headed back through the underpass and finished the last bit of circumnavigating of the East lake. As expected it was getting hot and the motorized boats were starting to buzz around us in quantity. But for a sunny Sunday afternoon in July the boats were surprisingly few. 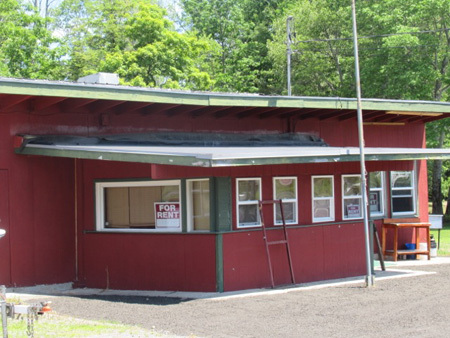 The State provides excellent well maintained facilities, campgrounds with full amenities and a fine day use beach. But many of the camps were empty, and to my astonishment I could see that the beach only had a small number of users in the afternoon when we were heading back. 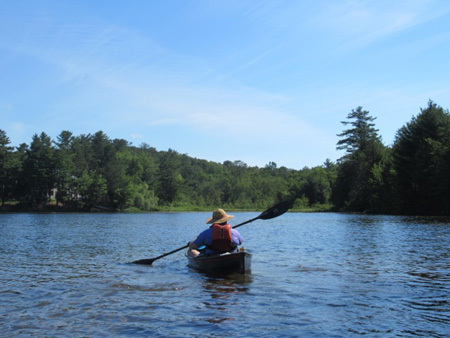 I’ll tell anyone that if you are looking for a beach that doesn’t get overcrowded during peak times on summer weekends or are looking for a low impact Adirondack campsite you don’t have to get on a waiting list for then head up to Caroga. After loading the boats on the car we headed up to the highway looking for a place to maybe have a light lunch. 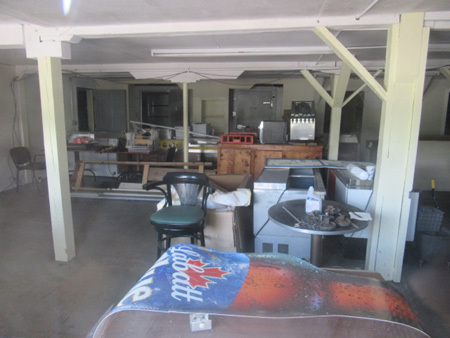 Instead we found empty buildings that once were businesses, abandoned in the last ten years. I would guess that after Sherman’s Amusement Park went under in 2006 these other businesses followed. This commercial center will be known as Town Center. 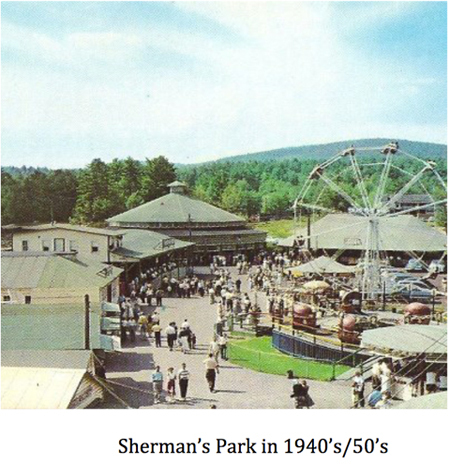 Town Center will be located near and around the former Sherman’s Amusement Park. Town Center will be a walkable, integrated open-air, multi-use development where residents and visitors will be able to gather, socialize, eat, live, drink, recreate, shop, visit, exercise and enjoy its attractive streetscape and landscaping. It will be anchored by retail, dining, and leisure uses, as well as by recreational and residential uses and be the most diverse area of the Town. All the right planning buzz words. Reading this after looking over Sherman’s Amusement Park, and after watching an old guy carefully mowing the grass with a push mower behind the abandoned bait shop out on 29A, it makes me sad. How will this miracle occur, where will the revenue come from? From what I could see the residents have a good deal of civic pride, enough to maintain appearances on their own initiative and enough to call in consultants to create a plan for the future. But something else has to added to this community to make it viable again. I suppose some filthy rich people could buy up the land around the lakes, tear down the fine old cabins and erect McMansions that they rarely visit. This would give the village some property tax revenue but not much more, it most certainly would not create a vibrant community with a strong economy. 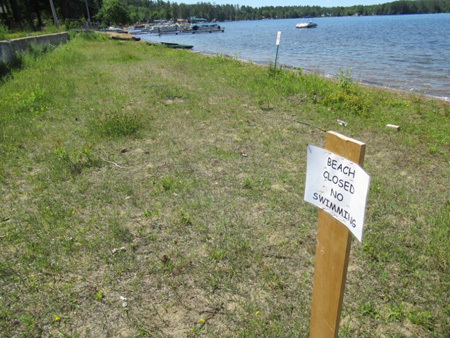 We’ve observed this phenomena on various local lakes, turning large chunks of the shore and of the community into exclusive absentee parcels has a deadening effect on the entire area around the lakes. What the Village of Caroga needs is some foreign immigrants to replace the old white people as they die off. Such folks have an incentive to work hard and create a viable economy from scratch. Really, all of Fulton County could use a massive influx of immigrants. Yeah I know, that’s a politically incorrect thing to say these days, but it’s a plain fact that immigrants have always been one of the best financial assets this country has. There would be problems that would come with immigrants, of course, but like the European immigrants that settled in Albany in the early and mid 20th century they would make opportunities where there were none before. That might not sit well with the old white folks who are inhabiting Caroga right now, watching their community decay alongside themselves. But oh well and too bad, change is not always pretty for everyone. After all, a community is really the sum total of the people who live there, right? .... watching their community decay alongside themselves. But oh well and too bad, change is not always pretty for everyone. Sounds like most of downtown Albany, only the old whites taking care of their parcels. It is too bad.